I came across this particular product while doing some grocery shopping a couple days ago. It looked intriguing but, at the time, I was on a tight budget and ultimately just left it in the store freezer. I was at the store again yesterday evening, however, and, since I knew my morning would be hectic and I would likely need to pick up something for breakfast anyway, I decided to purchase one of these for me and another one for my wife. After having it this morning, my opinion is a bit mixed. As far as convenience is concerned, I really had no complaints. All I had to do was remove the bowl from the box and pop it in the microwave for about 4 minutes. There were no other steps. In fact, I wasn't even required to remove or vent the bowl's cover. I will also say the bowl proved to be more filling than I was expecting. 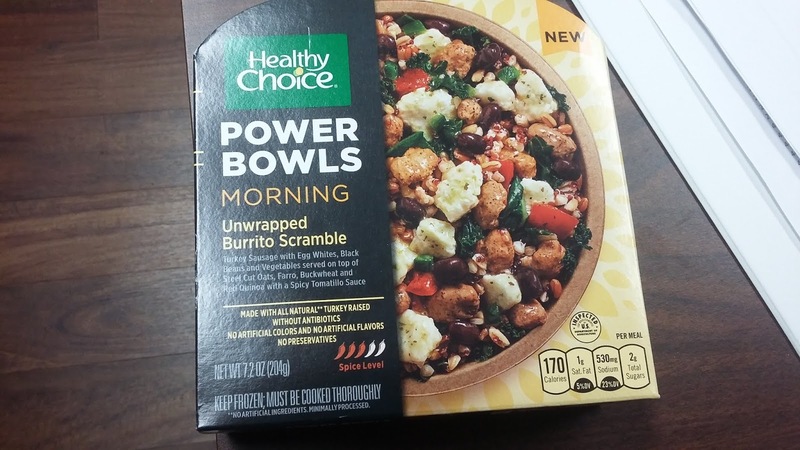 Since it was from the Healthy Choice brand, I wasn't really sure if that would be the case or if I would wind up needing to eat something else to get through my morning (which is why I brought grapes with me too). But, after finishing what was in the bowl, I was definitely satisfied hunger-wise. When it came to taste, however, I was a little disappointed. The sausage in the bowl was a bit on the spicy side (which, to be fair, the package did warn me about that) and that is definitely something that needs to be taken into consideration when having this first thing in the morning. However, the bigger disappointment was the rest of the bowl kind of proved to be a bit bland. So, when taking a bite, it was either spicy or had no taste at all, depending on whether or not I happened to have some sausage in that bite. As is usually the case with frozen products like this, the egg whites were also a little on the rubbery side. It's nothing that would prevent me from eating something like this, but it was also pretty easy to tell this came from the freezer section and wasn't something that was homemade. Final Opinion: It actually proved to be a little better than I was expecting it to be, especially when it came to filling me up. However, even though I would recommend giving it a try, I did think the sausage was a little too spicy for me (at least first thing in the morning) and probably wouldn't personally buy it again.